Nacewa left the field after just 16 minutes last night. ISA NACEWA BOARDED his fourth long-haul fly in the space of 12 days this afternoon nursing a calf injury which puts his involvement in the interpro clash with Munster in serious doubt. 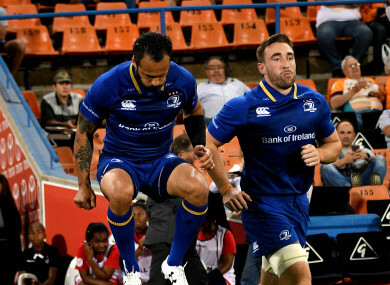 The Leinster captain lasted just 16 minutes of last night’s Pro14 defeat to the Cheetahs before hobbling off with a lower-leg injury, and Leo Cullen said he’s highly unlikely to feature against Edinburgh at the RDS next week. Nacewa will go for a scan upon the squad’s return to Dublin tomorrow but another 16 hours spent on a plane won’t do him any favours, particularly when you consider he’s already made the journey three times in the last two weeks. “Looking at him downstairs, yeah he’s unlikely to turn it around next week,” Cullen said when asked about the injury. Nacewa had only flown back to South Africa last Monday after he was initially refused entry into the country because of the visa mix-up which also involved scrum-half Jamison Gibson-Park. Both Kiwis returned to Dublin to obtain the necessary documentation before flying back to South Africa to meet up with the rest of the squad ahead of last night’s game in Bloemfontein. Nacewa’s involvement on the pitch was minimal and should the 35-year-old’s scan reveal extensive damage, questions will be raised over why Leinster took a risk by sending him back and forth between hemispheres; they play Munster on 7 October before the first two Champions Cup pool games. Cullen has promised an ‘extensive review’ of the province’s mini-tour of South Africa, although the head coach insisted they did a lot of things right both on and off the pitch. Part of that forward planning saw Stuart Lancaster return to Dublin on Wednesday to work with some of the players who had remained at home ahead of Friday’s clash with Edinburgh. Robbie Henshaw is set to make his first appearance of the season against the Scottish side while the likes of Scott Fardy and Devin Toner, whose wife, Mary, gave birth to their first child, are expected to come back into the fold. “Looking forward to getting the group back together next week, even though it’s a disjointed and short week ahead of Edinburgh,” Cullen added. Email “'Unlikely to feature next week': Nacewa to undergo calf scan after fourth long-haul flight”. Feedback on “'Unlikely to feature next week': Nacewa to undergo calf scan after fourth long-haul flight”.